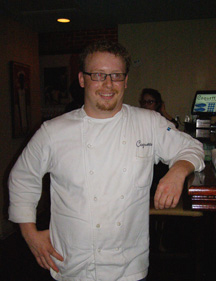 Chef Michael Stoltzfus is the owner of Coquette Bistro Wine Bar, located in the historic Garden District of New Orleans, Louisiana, where he focuses on American-style cuisine and changes the menu daily. Housed in a two-story building that dates to the 1880s, the restaurant is a hidden gem with innovative cuisine, a historic bar, exposed brick walls, and an impressive art collection. Chef Michael Stoltzfus graciously shares his recipe for Lamb Loin with Honey Lavender Vinaigrette, Pickled Ramps, and Local Greens. Passionate, dedicated, creative, and fun, Chef Michael Stoltzfus "found" his career from his mother, as well as his then girlfriend, and now fiancée and Coquette Co-Owner, Lillian Hubbard. Growing up on the Eastern Shore of Maryland on a farm, he was accustomed to having fresh ingredients, and his mother was an excellent cook. When she decided to open a small restaurant and serve breakfast, she enlisted her son's assistance, asking that he forego college for the moment, and work for her. He took to the restaurant world like the proverbial duck to water. Making light food during the day helped peak his culinary interest and with inspiration from an Alain Ducasse cookbook that he received from Lillian, he started working nights at fine dining restaurants to hone his skills. In early 2007, he and Lillian moved to New Orleans where he worked at the renowned Restaurant August owned by Chef John Besh for a year and a half. 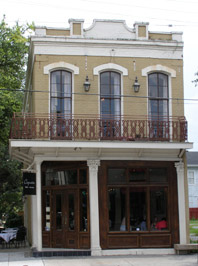 When the building that now houses Coquette Bistro Wine Bar became available in 2008, he and Lillian jumped at the opportunity to open their own restaurant. 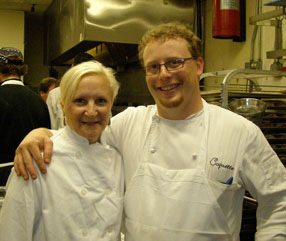 Since then he has been accruing accolades and awards for his culinary style and vision. We had the opportunity to get to know Chef Michael Stoltzfus over several months planning the menu via email and telephone calls for a special Tales of the Cocktail Spirited Dinner® one night only cocktail pairing dinner, and later working side-by-side with him and his team in the restaurant's kitchen, and at the bar. For this special spirits pairing dinner, Chef Michael Stoltzfus created the culinary recipes, and Luxury Experience Guest Bar Chef Debra C. Argen and Luxury Experience Guest Bar Chef Edward F. Nesta created the cocktail recipes. The theme for the dinner was "The Language of Flowers and Herbs and their Meanings in Life, Cocktails, and Cuisine©" using floral and herbal elements in each of the courses and the cocktails to tell a "tale" over the course of the evening. It was very interesting to work to Chef Michael Stoltzfus and see the process from the development of an idea for a dinner, work on the details for the menu concept, the creation of the recipes, and then be there to taste the culmination of all the months of hard work the night of the dinner. After working in the kitchen beside Chef Michael Stoltzfus you realize all of the hard work and many long hours that go into the creation of a special dinner, and appreciate it all the more. For chefs, there is no where they would rather be than in their kitchens dreaming up new ideas. Chef Michael Stoltzfus graciously shares his recipe for the Lamb Loin with Honey Lavender Vinaigrette, Pickled Ramps, and Local Greens. Bon Appétit! Chef Michael Stoltzfus graciously shares his delectable recipe for Lamb Loin with Honey Lavender Vinaigrette, Pickled Ramps, and Local Greens. Bon Appétit! Method: Season the lamb loin generously on all sides with salt, pepper, and thyme. Let sit for 20 minutes at room temperature. Heat a sauté pan on high heat. Add neutral olive oil and when smoking, sear lamb loin on each side for two minutes. Let rest. Method: Combine all ingredients and mix well. Method: Thinly slice ramp bulbs. Heat rice wine vinegar and sugar until sugar is dissolved. Add water and sliced ramp bulbs. Let sit for at least one day. Method: Clean frisée by removing all of the green top and large stems. Season with good olive oil and a squeeze of fresh lemon juice. Plating: Slice lamb loin into 1/8 in slices. Dress lightly with honey lavender vinaigrette and flaky sea salt. 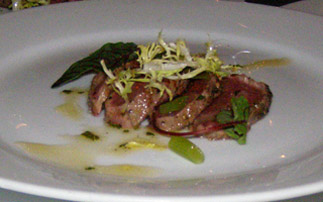 Garnish each slice with 3 pieces of pickled ramps, a chive blossom, and two sprigs of dressed frisée. 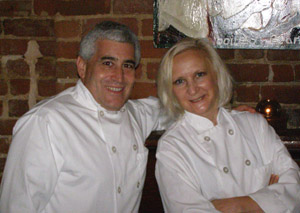 Guest Bar Chefs Debra C. Argen and Edward F. Nesta graciously share their cocktail and sorbet recipes. The Welcome Cocktail, Good Times to Come sets the tale of The Language of Flowers and Herbs and their Meanings in Life, Cocktails, and Cuisine© by welcoming you, and letting you know to be patient as there are good times to come. The cocktail incorporates Champagne, G'Vine Floraison, pineapple juice (the pineapple is the universal symbol of hospitality), chamomile tea and thyme simple syrup (chamomile represents patience, thyme represents happiness), and a thyme garnish. Method for the Chamomile Tea and Thyme Simple Syrup: Make ahead and store in airtight covered jar in the refrigerator until ready to use. Will hold for several weeks in the refrigerator. In a large saucepan, add 1 cup of water, 1 cup of sugar, 3 chamomile tea bags, and 3 sprigs of thyme. Bring mixture to a boil and then let simmer to dissolve sugar for 2 minutes. Let cool at room temperature for 1 hour, strain, and then store in a glass jar in the refrigerator until ready to use. Method for the Cocktail: Chill the champagne flute; add pineapple juice, chamomile tea and thyme simple syrup, G'Vine Floraison, and champagne. Stir, and garnish with a thyme sprig. The second cocktail, Getting to Know You, incorporates rosemary for remembrance (listening and remembering the conversations), and lavender to express devotion and loyalty, and features Leblon Cachaça, Sherry, rosemary vinegar, Fee Brothers Lavender Water, honey water, and fresh lavender flower garnish. Method for the Rosemary Vinegar: Make ahead and store in airtight covered glass jar until ready to use. In a saucepan bring 1 cup white vinegar and 4 tablespoons rosemary leaves to a boil. Cover and let sit for a few hours to infuse. Discard rosemary and pour vinegar into a glass bottle with cork top or wrap top with plastic wrap. May be made ahead and kept for several months. Method for the Honey Water: May be made ahead. Mix ½-ounce honey and 2 ounces hot water in a jar and shake to combine. Method for the Cocktail: Add ingredients to a large shaker. Shake with 4 ice cubes, and strain into a rocks glass filled with fresh ice. Garnish with fresh lavender flowers (if available, or rosemary sprig if not). The third cocktail, Flattery will Get You Everywhere, represents the "courtship" stage, flattering to entice and engage, and incorporates fennel, to express flattery. The cocktail is made with Mount Gay Rum infused with fennel, Galliano, clam juice, and light cream, with fennel frond garnish. Method for the Fennel Infused Mount Gay Rum: Infuse Mount Gay with fennel for several hours or overnight. Method for the Cocktail: Add all ingredients to a large mixing glass with 4 ice cubes. Stir and strain into ice-filled rocks glass. Garnish with fennel frond. The fourth cocktail, Flirtatious, continues the relationship using basil for good wishes, love, and wealth, mint for wisdom and virtue, and hibiscus to express rare beauty, and incorporates Vermont Spirits White Vodka, watermelon juice, basil and mint simple syrup, Fee Brothers Rhubarb Bitters, Fee Brothers Hibiscus Water, has a mint garnish, and a hibiscus sugar rim. Method for Basil and Mint Simple Syrup: Make ahead and store in airtight covered jar in the refrigerator until ready to use. In a large saucepan, add 1 cup of water, 1 cup of sugar, and 2 sprigs of mint and 2 sprigs of basil. Bring mixture to a boil and then let simmer to dissolve sugar for 2 minutes. Let cool at room temperature for 1 hour, strain, and then store in a glass jar in the refrigerator until ready to use. Will hold for several weeks in the refrigerator. Method for the Hibiscus Sugar: Make ahead and store in airtight covered jar until ready to use. In a bowl, mix 1 cup of sugar and 2 teaspoons Fee Brothers Hibiscus Water. Spoon sugar onto parchment lined tray, and let dry. Store sugar in an airtight covered jar until ready to use. May be made ahead and stored. Method for Cocktail: Rim edge of glass with lime wedge and then twist edge in hibiscus sugar. May be made ahead and set aside. Add the Vodka, watermelon juice, lime juice, simple syrup, and Fee Brothers Rhubarb Bitters to a large shaker. Shake with 4 ice cubes, and strain into a rocks glass filled with fresh ice. Garnish with a sprig of mint. By the fifth cocktail, we have welcomed you, expressed interest, flattered and flirted, and now we are Smitten. This cocktail incorporates Scorpion Mezcal, sweet corn, lime juice, agave nectar, Grand Marnier, fresh tarragon, and tarragon sea salt rim. Method: Add all ingredients to a blender and liquefy. May be made ahead and stored in the refrigerator. Method for the Tarragon Sea Salt Rim: In a small blender, add 1-teaspoon fresh tarragon leaves. Finely grind. Add 1-tablespoon sea salt and process until smooth. Method for the Cocktail: Pour tarragon salt onto small plate. Rim outside edge of Margarita glass with small lime wedge and then rim with the tarragon salt. Chill glass in freezer. May be made ahead. Pour the blended ingredients in a large shaker with 4 ice cubes. Shake hard until can is frosty. Strain into chilled Margarita glass. Beauty incorporates Karlsson's Gold Vodka, hibiscus to express rare beauty, simple syrup, black pepper, and Fee Brothers Hibiscus Water. Method: Bring water to a boil in a pot, add dried hibiscus flowers and boil for 30 minutes. Strain and discard flowers. Method: Bring 16 ounces hibiscus flower water and sugar to a boil for 3 minutes to dissolve the sugar. Let mixture cool over ice water bath. When cool, add the Karlsson's Gold Vodka, Fee Brothers Hibiscus Water, ground black pepper, and process in an ice cream maker. Can be made several days or a week in advance. Elegance incorporates Esprit de June Liqueur, jasmine tea to expresses elegance, simple syrup, and Fee Brothers Jasmine Water. Method: Bring water to a boil in a pot, add teabag and steep for 5 minutes. Method: Bring 18 ounces jasmine tea and sugar to a boil for 3 minutes to dissolve the sugar. Let mixture cool over ice water bath. When cool, add the Esprit de June Liqueur and Fee Brothers Jasmine Water, and process in an ice cream maker. Can be made several days or a week in advance. *Alternative Method for Sorbets: Place mixture in an airtight container and freeze until mixture is firm (will take several hours), remove from container and process in blender until mixture is light and fluffy. Return to container and freeze overnight. The sixth cocktail, Joyful, sends the message of our strong bond as the evening progresses incorporating parsley for joy and useful knowledge, cilantro for sincerity, and garlic for strength. The cocktail incorporates Milagro Tequila Reposado, grilled tomatoes, cilantro, parsley, garlic, lime juice, tomato juice, and candied sun dried tomato and cilantro garnish. Method for Candied Sundried Tomatoes: Make ahead. In a small sauté pan, add 1 tablespoons sugar and 1 tablespoon water and bring to a boil. Add 10 sundried tomatoes to pan and sauté to coat with sugar. Remove candied sundried tomatoes to parchment paper, garnish each tomato with a cilantro leaf and let dry. Method for the Cocktail: Make ahead and chill for several hours to allow flavors to mellow. Grill tomatoes, and then add all ingredients to a blender and process until smooth. Make ahead and refrigerate. At serving time, chill Martini Glass. In a shaker can, shake cocktail with 4 ice cubes until can is frosty, strain into Martini glass. Garnish with a sprig of cilantro and a candied sundried tomato with cilantro leaf. The last cocktail of the evening, Happily Ever After, culminates in the tale with the expression of passion using orange rose petals, thyme for happiness, and orange blossoms for marriage, and incorporates Citadelle Gin, Peach juice, thyme infused light cream, maple syrup, Fee Brothers Orange Blossom Water, and has an orange rose petal garnish. Method for the Thyme Infused Half & Half: Make ahead. Infuse for several hours or overnight. In a covered glass jar, add 1-ounce light cream and 8 thyme leaves. Infuse for several hours or overnight. Method for the Cocktail: Add all ingredients, except garnish, to a large mixing glass with ice. Shake hard and strain into ice-filled rocks glass. Garnish with an edible orange rose petal. Coquette Bistro Wine Bar is open for Dinner everyday from 5:30 pm until 10:00 pm, for Lunch from Wednesday thorough Saturday from 11:30 am until 3:00 pm. 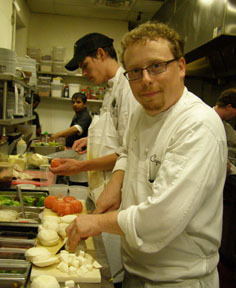 Visit Coquette Bistro Wine Bar website www.Coquette-NOLA.com for menu samples, as Chef Michael Stoltzfus changes his creative menu daily. Read about Coquette Bistro Wine Bar and the Tales of the Cocktail Spirited Dinner® in the Restaurants section and in the Liquor Cabinet section.